which has its, own, 10 µm, scale bar. Figs. 1, 2. Tetraplagia distephanis. Fig. 1: "delicate" variant, BSS 15B(F) EF W31; Fig. 2: "robust" variant, IOW 156(F). Figs. 3-6. Pseudocubus obeliscus. Figs. 3a,b: oblique lateral/basal view, BSS 13B(F2), same specimen, different focal points; fig. 4: lateral view, BSS 141B(Q) EF C27; fig. 5: basal view, IOW 148(F); fig. 6: oblique basal view, BSS 30B(F). Fig. 7. Acanthodesmia renilla BSS 28B(VI/513). Only one lattice-plate is visible; the other has sunk into the wax covering (used as adhesive) of the SEM stub. Figs. 8-10, 15. Acanthodesmia zonaria BSS 28B(VIII/1057), IOW 134(F), IOW 136(F), IOW 138(F). Figs. 11-14. Acanthodesmia viniculata showing morphological variation of arc shape and spine development. BSS 9(F), 49(F) EF M27 and 28B. 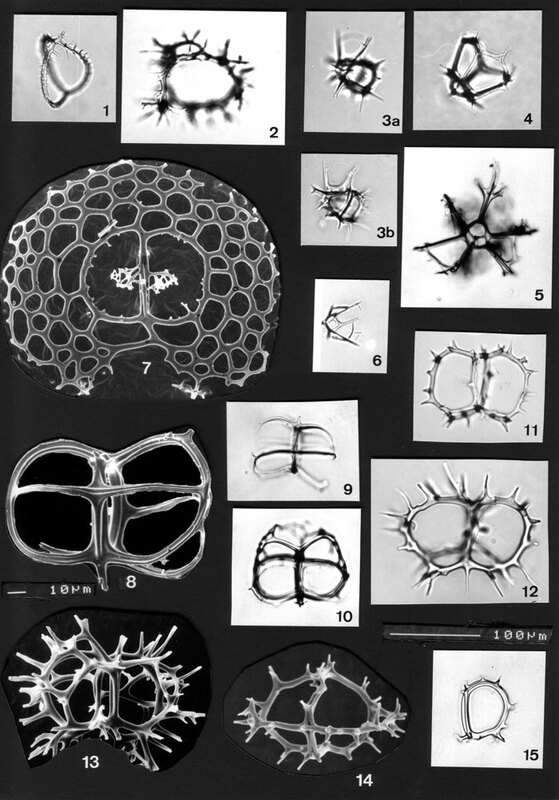 Figures 11, 12 and frontal and an apical view of the most common morphotype; fig. 13 is a frontal view of forma foliosum, which has bladed, sometimes branching spines.